Between the Synapse issue update on Arkansas’s rush to execute 8 people in 11 days. Late in the evening on April 20, the State of Arkansas executed Ledell Lee for the 1993 murder of 26-year-old Debra Reese. Put to death by lethal injection, the 51-year-old Ledell was Arkansas’s first execution since 2005 and the first of eight initially planned executions over the course of 11 days, a binge brought on by the April 30, 2017 expiration date of the state’s supply of one of the three chemicals required for lethal injection. 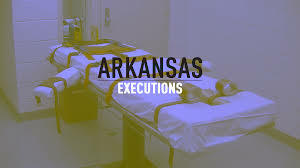 For more check out Radley Balko’s Op-Ed in The Washington Post, The debacle in Arkansas reaffirms that the death penalty is arbitrary, unchecked and unfair.